The ferocious looking dragon in the Dragon's Inferno slot machine is your friend, and there is no need to train your dragon as it's ready to help you on your quest to find hidden riches. This slot is a 30-payline video slot that requires a bit of bravery on your part, as you seek to hit the bountiful features that house your riches! The ferocious looking dragon in the Dragon’s Inferno slot machine is your friend, and there is no need to train your dragon as it’s ready to help you on your quest to find hidden riches. This slot is a 30-payline video slot that requires a bit of bravery on your part, as you seek to hit the bountiful features that house your riches! The game is set within the fiery depths of a Dragon’s cave with symbols on the reels including the Red Dragon, an archer, an elf, a treasure chest, a potion, a sword a crystal ball and all four card suits from hearts to diamonds and spades to clubs. Treasure Box Wilds – The Treasure Box is wild and substitutes for all regular symbols apart from the Dragon, which is the scatter. Watch out for the replicating wilds! If you hit the Dragon Treasure symbol in a winning combination, the Dragon will emit a huge fireball that will land anywhere on the reels and the symbol it lands on is immediately turned into a wild. The Dragon only appears on the 3rd reel. 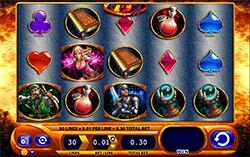 Dragon Free Spins – Trigger the Free Spins round when you have 3 or more Dragons scattered anywhere on the reels. The number of Dragons you have activating this feature will determine the number of Free Spins awarded. For example 3 scatters trigger 10 Free Spins, 4 scatter symbols trigger 20 Free Spins, while 5 scatters trigger 40 Free Spins. All wins during the Free Spins are subject to a 2X multiplier. Better still, you can also trigger the replicating wilds during the Free Spins. You can also retrigger the bonus round by getting 3 or more Dragons on the reels.